Lydia Olson, age 86 of Osakis passed away on Thursday, March 21 at Bethany on the Lake, Alexandria. Funeral services will be held on Sunday, March 24 at 2:00 pm at Elim Lutheran Church in rural Osakis. Burial is at the church cemetery. Visitation begins one hour prior to the service at the church. On April 17, 1932 a baby girl was born to Edwin and Estella (Bakken) Brendmoe at their home in Todd County, MN. They named her Lydia Mavis and she was their only daughter and grew up with her brother, Ernest. She attended Osakis High School and graduated with the Class of 1951. After high school, Lydia attended the beauty school in St. Cloud, MN. She became a hair stylist and worked at a shop she operated in Milaca, MN. On July 27, 1967 Lydia was united in marriage to Ole Olson at the Salem Lutheran Church in rural Osakis, MN. They made their home in Osakis and Lydia opened a beauty shop in Osakis. They had two children, a son and a daughter. Lydia attended both Salem and Elim Lutheran churches throughout her long life, and especially loved to help with the quilt projects for the missions with the ladies from Salem. She was a talented seamstress who also liked to do handiwork projects such as embroidery, crochet and/or knitting. She liked to keep her hands busy and gifted many family and friends with beautiful projects over the years. Lydia was known for her pleasant disposition and ready smile. She loved to gather with friends and socialize, which also made her the perfect hair stylist who quickly put her customers at ease. She enjoyed long drives in the country and liked watching the seasons change. She spoke Norwegian fluently and was honored to be able to interprete it for others who didn’t. She was an excellent baker who could make delicious sugar cookies and Norwegian treats like flatbread and lefse. She was a loving and doting mother and grandma who will be dearly missed by all who knew her. 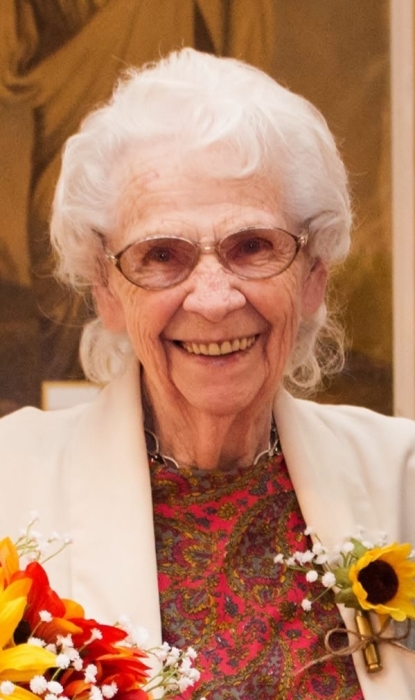 Funeral services for Lydia were held on Sunday, March 24, 2019 at 2:00 pm at Elim Lutheran Church with Rev. Lindell Quam officiating. Musicians are Juanita Klukken and Dorte Hagen. Interment is at the church cemetery with honorary bearers, Paul Skavdal, Delores Gillan and Ina Larson. Active casketbearers were Sam Larson, Carmen Sorenson, Howard Haider, Alden Johnson, John Johnson and Jim Johnson.